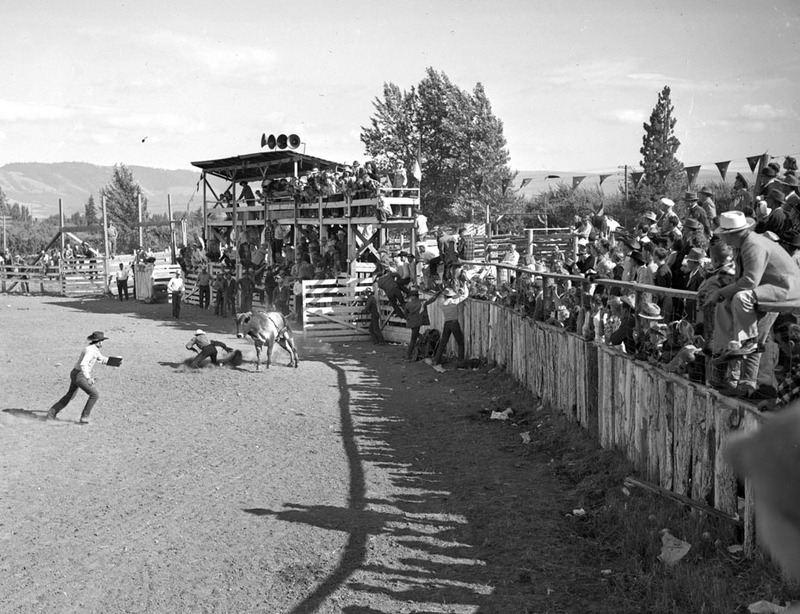 Finally an action shot from the 1947 rodeo. Based on his negatives you would think Joe Young was more interested in the fund raising at the food cart than the action on the field, but here's a little real rodeo action. Definitely as I remember the rodeo arena. Looking at the construction of that wall, no wonder the big bull went over or through and ended up down near Gracie Sue's. I think that was probably the highlight of that particular rodeo, as sure it was that year when that event took place. Certainly wish we could ID some of the people in the picture. As Martha McKeown would say...."Them Was The Days." The judge has a ways to run before he gets to the fence. Hope he made it in time. Not that the fence looks like much protection. I wonder who the stock contractor was? Where is this? Near China Gorge? Maybe rodeo clowns hadn't been invented yet. Rodeo grounds, Saddle Club was out on Belmont.